The instructions listed below are based on firmware release version 3.56m for the Snom 1xx/2xx series. If you are running a different software version or phone some menus and settings may be different. 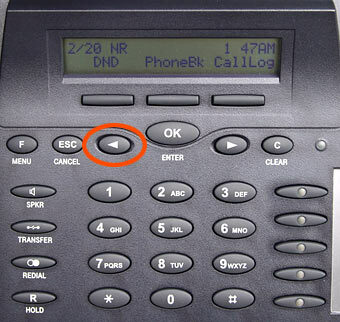 Some menus and settings may not apply to the specific Snom phone model you have. These instructions are based on using the Snom's factory default configuration which is to obtain a dynamic IP address automatically from your router using DHCP, which is how most people have their routers configured. 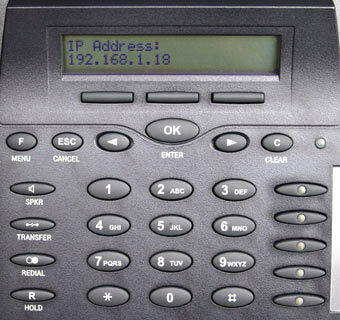 For information on configuring your Snom phone with a static IP address, please refer to the user manuals. Connect your Snom phone's network Ethernet port to your router or hub/switch. Plug the supplied power cable into the phone. Wait until the phone finishes booting; at which point you should see the date and time on the display. 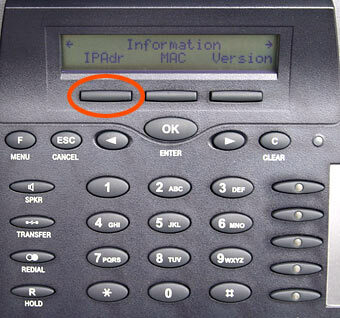 You will now see on the display the IP address of the phone, as shown below. Write down the IP address shown on your phone. Open a web browser on your computer such as Internet Explorer and enter the IP address shown on your phone in step 4 as the address (I.E. where you would normally enter www.yahoo.com). You should now see a page that looks like the image below. Click on the Line 1 option under "Setup" in the menu on the left side of the page. On the "Line 1" page configure the settings at the top of the page as follows. See this picture for all other settings on the page. After you have configured all settings on the "Line 1" page. Click the Save button at the bottom of the page. Wait 20 seconds before continuing. If you see "Ok" next to "Status:" continue to the next step. If you do not see the Status as "Ok" wait 60 seconds and click the Line 1 menu again. If at this point you still do not see "Ok" next to status verify all settings entered in step 6 are correct, and that your internet connection is currently up and running. If after verifying all settings and your internet connection you are still having problems registering your phone, you should reset your Snom phone to its factory default configuration by going to the Advanced menu and clicking the Reset button on the bottom of the page; at this point you will need to start the configuration of your phone over from Step 1.